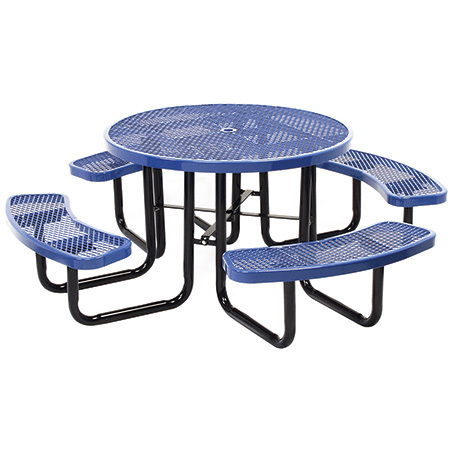 [XPB-T46ROXXX] This Round Picnic Table features a 46" diameter table top and four bench seats. Table top and bench seats are constructed in heavy duty expanded metal and coated in Thermoplastic, a durable weather resistant coating and available in 16 Color Choices. The under structure is protected in a black powder coating. Choose from Portable, Surface Mounted and In-Ground mounting styles. This table is ADA approved for the handicapped in a portable model featuring 3 seats. Optional Leg Protectors, Anti-Skateboard Tabs and Umbrella and matching Receptacles sold separately. For shipping quotes, discount pricing, orders or questions please call our Customer Service Center at 1-877-483-9270.